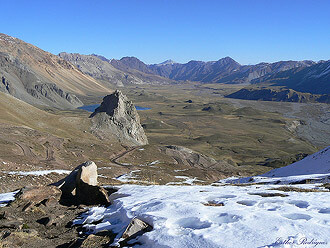 Vallecitos is a small ski area owned and operated by the Ski Club Mendoza. Skiing at Vallecitos is characterized by open, treeless, rolling slopes covered with abundant snow. It is popular with the local Mendocinos when they just want to get on the snow for a day. There is plenty of advanced terrain both in the ski area and out-of-bounds, but most skiers will need only one full day to fully explore the lift-serviced slopes. Since 1990, two double chairlifts and a surface lift have been added. The upper Las Morenas chairlift carries skiers to the top of the valley in which the ski area sits. Hikes and high traverses to off-piste runs should begin here. The new Hosteria Cerro Nevado is now fully operational with ski-hotel packages available. With inconsistent snow at Penitentes and high prices at Las Leñas, Vallecitos remains the locals' favorite. Vallecitos sits in the glacier-carved Valle del Plata. 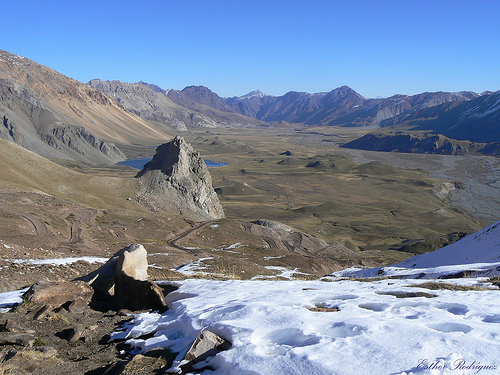 It is located on the north side of the wide, moraine valley of the Cordón de La Jaula, with most of the runs facing south-southeast. The ski area base is positioned just above the normal snow line, but good skiing can often be had below the ski area as well. Storms of various sizes approach from the southeast and the Atlantic Ocean. All the lifts were built locally by Francisco Guiñazú and his crew. The prestige and economics of local manufacture is unmatched anywhere else on the continent, but it should be noted that the lifts do not always meet international standards. For example, the chairlifts sag low between towers, and derailments are not uncommon (but are repaired expediently). Skiers need to pay attention to these situations and should expect some inconveniences. Please have patience when trouble occurs, and recall the low ticket price. Beginner skiers are usually sent to the Escuela single chair and the Enlace run. They can then return to the base by following the Sur trail. Intermediate skiers should head up the valley to explore the variety of runs and pitches of the Las Morenas chairlift. Advanced skiers should ski the south-facing sidewalls above the Slalom trail. This area is called the Filo de Loma Blanca. Take a high traverse from the top of any of the chairlifts to access the long ridge that parallels them to choose from a multitude of short, small bowls and thin, twisting chutes. Thrillseekers should traverse a bit farther around the Loma Blanca ridge to discover an excellent east-facing chute system north of the ski area. These can be accessed with the Canaleta chair if skiers remember to traverse out high enough to return to the base. Another idea is to ski the large bowl below the ski area that looms above one of the access road's switchbacks. A rocky traverse leads to this bowl but it is the easiest accessed off-piste skiing in the area. Vallecitos has some of the best off-piste skiing in Argentina, and observant skiers will easily find a great deal of out-of-bounds skiing. Ideas include the large bowls northeast of the ski area. These are reached with an hour-long, ridgeline hike, and the long run-out canyon below empties to a convenient location on the Vallecitos road. More strenuous efforts can be made in the Rincón Valley south of the ski area. As with other locations in the Alta Cordillera, avalanche danger can be extreme. Good nordic skiing can be enjoyed in the Vallecitos area in spite of the high elevation. The two relatively flat glacier valleys in the area provide vast expanses of skiable terrain in a zone of otherwise rugged and inaccessible mountains. 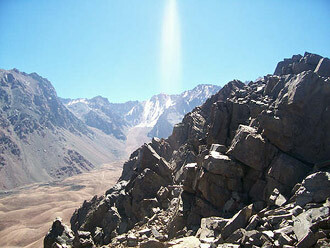 Follow either the main Vallecitos valley to its origin, or try the geographically similar Rincón Valley farther south.